You can activate a SIP account with Ottspott in the "Users" section. 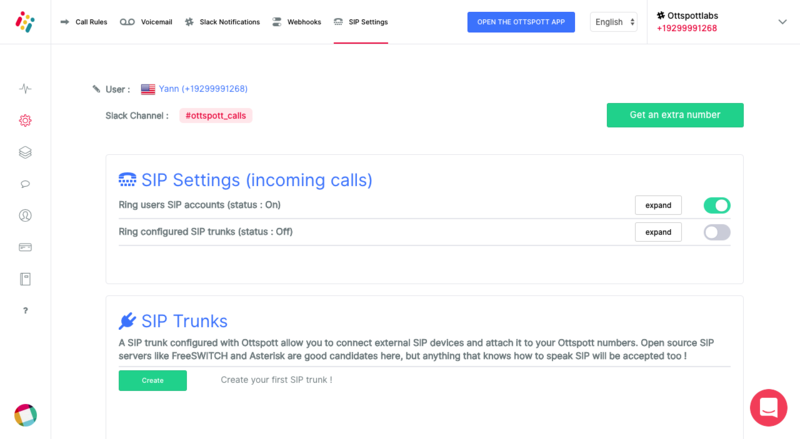 For each user, the SIP credentials are automatically generated by Ottspott. To receive calls on your SIP account, you must activate "Ring users SIP acount" in the "Number management" section "SIP Settings" tabs for each Ottspott number you are using. Step 1: Activate your SIP account, click to expand button and you can see a QR code button to set your SIP account on Zoiper software. - Open the app and on the "Dialer" menu click on the "QRcode" icon at the bottom left. - Scan the QR code with Zoiper software. Step 3: Go to "Number management" section "SIP Settings" tabs on Ottspott and activate "Ring users SIP acount" option. Great now you can receive and place call on your mobile with Zoiper softphone.